The answer to your question, Dom, is another question: Have you been good about installing Windows updates? Because when Microsoft released Vista Service Pack 1 back in 2008, it included a recovery-disc builder very similar to the one bundled with Windows 7. 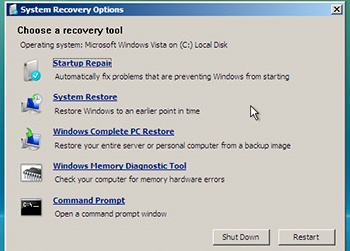 To see if you have it, click Start, All Programs, Maintenance, Create a Recovery Disc. Then just follow the instructions. If for some reason you don't have SP1 or can't find the tool, try NeoSmart's Windows Vista Recovery Disc, which is available in both 32- and 64-bit versions. And what about XP users? Your best is UBCD4Win, a free bood-CD creator that provides a wide variety of tools for repairing Windows. Whatever tool you use, don't put off using it. You just never know when something will get fouled up on your PC, leaving you with no way to access your programs and data. A bootable repair disc can really save the day.